Perfect KETO is one of the newest brands to jump into the 'KETO Craze' as I would call it. There are a few things that you should know before doing the whole KETO diet, and although I'll admit that I am not the MOST knowledgeable resource on the planet, I am fairly confident in something, that is I don't think you can put yourself into Ketosis by ingesting ketone. Maybe someone can prove me wrong, but it is MY understating that in order to achieve ketosis you've gotta basically just NOT eat. Or at least NOT eat carbs. I'm not sure precisely how long- I've heard as little as an overnight fast, or up to 3-6 days to a week to actually achieve ketosis. No matter,let me put it this way, I'm very skeptical about all these keto products that try to claim that they through you into ketosis by taking them. Just read my KETO OS reviews. Or my review of BPIs bogus Keto pre workout. Actually this Perfect Keto company has a pre workout product as well that I'm going to try out. But I'll stop my preaching and spend the rest of the review on the product itself. The takeaway from this rambling is that I do not think taking this product alone puts you into ketosis. Alright so that's out of the way, let's talk about flavors and taste first, shall we? There are two flavors of the Perfect KETO protein powder. One is the chocolate, and one is simply unflavored. I tried both, and think that the chocolate is much better. What a surprise, right? Lol. But keep this in mind, while on it's OWN, the chocolate flavor of Perfect KETO Collagen protein is much better, I think the unflavored is also really nice because it REALLY IS unflavored. Like. Literally it tastes like nothing. I tried a little mouthful of it to be honest just to gauge if there was an underlying flavor to Perfect KETO protein and there really isn't. In fact it might actually add a nice smooth texture when used as an addition to fruit / veggie smoothies, which is how I was using it eventually. The chocolate flavor though- while it is very drinkable, I don't know that I would choose it over some of the other protein powders I've reviewed here on the blog. It's sweet, but lacks some of the really bold flavors that I prefer to get in my proteins. So overall I'll chalk up the flavor component as a plus for Perfect KETO. Let's move into the ingredients now. And that is surprisingly every ingredient in the Perfect Keto protein powder. Just two ingredients. It's pretty neat that the chocolate flavor also still has some nice flavors even just with two flavoring ingredients. So. Yeah the ingredients are great! Vegans won't be using this one because collagen is from cows. But it's a great source of protein and even if I don't think the added MCTs throw my body into ketosis, I have found that the collagen helps my body feel re-vitalized and definitely does help with skin and nail. So formula gets an A from me. I like how minimalist it is. One quick note is that each serving has 10 grams of protein instead of 20 like you see with some other 'bodybuilding' style protein powders. So if you are used to, or prefer more than 10 grams, like me, you might want to note that your forty dollar jar has about half the protein of comparable protein supplements on the shelf. Perfect KETO Protein Looks Nice. I think the Perfect KETO collagen product, if nothing else, looks splendid. They've used a really fabulous teal or aqua marine color as the primary theme color of this protein supplement. 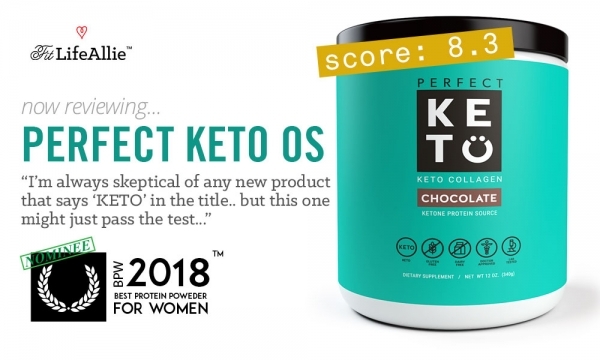 The name Perfect Keto is well-chosen, and I think the branding overall is quite attractive. There ARE a few nit-picky things that keep Perfect KETO from getting an 'A' on packaging, but overall it's nicely done. I think the black type over the teal color lacks the necessary contrast that would make all the information very very legible, but it's not a big issue. I also think they information on the front panel could be scaled up a bit. Again nothing major. All-in-all it's a handsome package.